As lab grown meat inches closer to commercial viability, F&B players will soon have to ponder the implications. When is a burger not a burger? According to some, it's when the beef between the buns was created using a laboratory process that involves the harvesting of muscle cells from a living cow. The cells are then fed and nurtured so they multiply to create muscle tissue, which is the main component of the meat we eat. The cells grow into strands that are then combined to create meat. According to researchers on the subject, it is exactly the same biologically as the meat tissue that comes from a cow. Reflecting the differing views on the subject of lab-grown food, this version of meat is variously known as in-vitro or non-sentient meat, cultured beef or the more dramatic victimless beef. Whatever it's called, it has aroused both excitement and suspicion in the food industry as it makes its way towards commercial viability. Cultured beef literally appeared on the stage in London at 1pm UK time on Aug 5, 2013, when Professor Mark Post of Maastricht University unveiled what he called world’s first cultured beef burger. Some 200 journalists and academics attended the event where the burger was cooked and tasted life. The beef in the burger was made up of around 20,000 muscle strands grown in Prof Post’s laboratory, and seasoned with egg powder, bread crumbs and other common burger ingredients. The "Post burger" was cooked at event by Richard McGeown, the chef of Couch’s Great House Restaurant in Cornwall, and tasted by Prof Post as well as a food writer and a nutritional researcher. Prof Post, one of the leading advocates and researchers of cultured beef, described the event as "vital proof of concept" that meat culturing techniques work. One major stumbling block of producing the Post burger was its price tag - which was estimated to be over US$300,000, or roughly the cost of more than 70,000 Big Macs in Singapore. Remarkably, in less than two years since the unveiling of the Post burger, the cost has fallen dramatically. Prof Post estimated in a recent interview with ABC news in Australia that it's possible to produce lab-grown beef for as little as US$80 a kilogram. Significantly for the industry, he believes that it will be priced competitively to the real thing within a few years. "I do think in 20, 30 years from now we will have a viable industry producing alternative beef and there will be a growing market for it and eventually a really large market," he said. Industry players are also excited about the prospect of a new source of meat to make up for expected shortfalls in supply in the future. "This technology we are hearing more about has the capacity to be a major disruptor to the worldwide beef industry," said Tracey Hayes, the CEO of the Northern Territory Cattlemen's Association in Australia, who had invited Prof Post to address her members earlier this year. However, even as cultured beef becomes a reality, much controversy still surrounds it and other alternative forms of food such as genetically modified crops and livestock. Proponents of this form of meat are excited about its benefits. 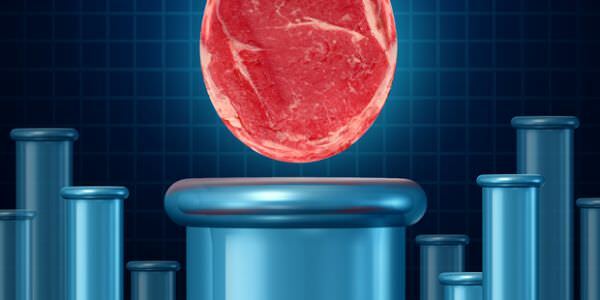 Research from the University of Oxford research suggested that producing in-vitro beef could use as much as 99 percent less space than what is needed for current livestock farming methods. Supporters also say that it is less objectionable than traditional meat because it doesn't involve killing and reduces the risk of animal cruelty. There are many others, however, who are set against eating any form of food that was not developed naturally. Meat grown in a lab is likely probably reach our dining tables sooner rather than later, yet it is still far from clear whether it will ever replace the real deal.